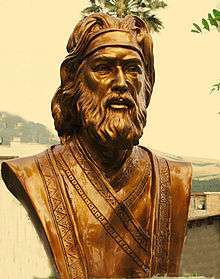 Fakhruddin As'ad Gurgani, also spelled as Fakhraddin Asaad Gorgani (Persian: فخرالدين اسعد گرگاني‎‎), was an 11th-century Persian poet. He versified the story of Vis and Rāmin, a story from the Arsacid (Parthian) period. The Iranian scholar Abdolhossein Zarrinkoub, however, disagrees with this view, and concludes that the story has its origins in the 5th-century Sasanian era. Besides Vis and Rāmin, he composed other forms of poetry. For example, some of his quatrains are recorded in the Nozhat al-Majales. A native of Gorgan, Gurgani accompanied the Seljuq ruler Tughril during his campaigns in Iran. When Tughril seized the major Iranian city of Isfahan from the Kakuyids in 1051, he appointed a certain Amid Abu'l-Fath Muzaffar as its governor. Gurgani thereafter settled in Isfahan, where he established good relations with its governor, who took him under his protection. During one day, when Gurgani and Abu'l-Fath Muzaffar were talking, Abu'l-Fath Muzaffar asked the following thing; “What do you say about the tale of Vis and Rāmin?” Gurgani then told him that the story was only written in Middle Persian. Abu'l-Fath Muzaffar then asked Gurgani to versify the story, which he did; during the Mehregan festival, Gurgani presented the poem to him, in which he applause's Tughril, the vizier Abu Nasr Kunduri, and Abu'l-Fath Muzaffar. Gurgani later died in c. 1058. 1 2 Meisami 2002, pp. 162-163. Vīs and Rāmīn, by Fakhr al-Dīn Gurgānī, translated from Persian by George Morrison, UNESCO Collection of Representative Works: Persian heritage series, no. 14, xix, 357 p. (Columbia University Press, New York, 1972). ISBN 0-231-03408-3. Meisami, Julie Scott (2002). "GORGĀNI, FAḴR-AL-DIN ASʿAD". Encyclopaedia Iranica, Vol. XI, Fasc. 2. pp. 162–163.